We want to create, contribute, and make a difference. To shape a community that is colourful, vibrant and united. 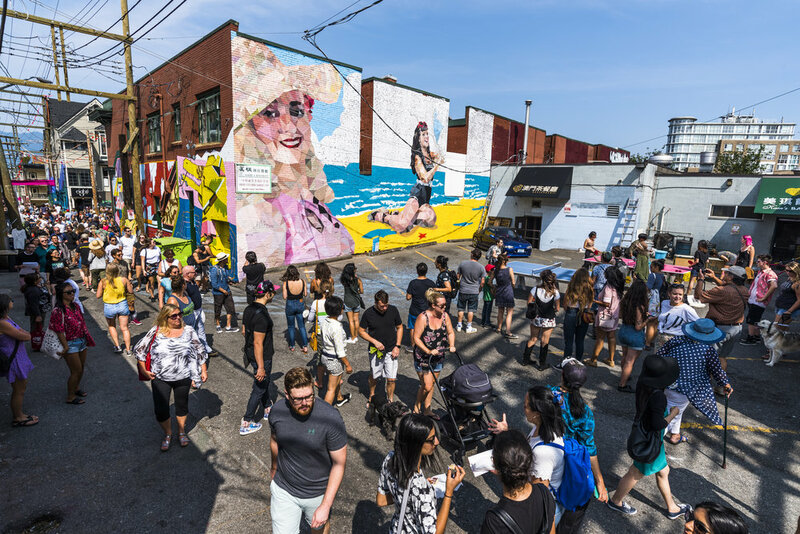 A partnership with Vancouver Mural Festival is a chance to be part of something huge, to contribute to a lasting legacy, and to lead and inspire the next generation of young artists. Murals aren’t just the end goal, they’re part of an evolution. A way to bring tens of thousands of people together, to share our stories, and to paint blank walls with local pride. We believe community is more than what’s tangible and that by bringing art to public space we can help build a lasting sense of place and community for everyone. We’re changing the way art is seen in Vancouver. As a local grassroots non-profit we sincerely value the support of our sponsors and endeavor to build long-term partnerships with organizations that share our values. We have a wide range of opportunities from booths and street level activations to mural sponsorships and presenting partnerships. Each package is custom built to help meet the specific goals and needs of partners. Please send us a message via the form below to request more information or set up a call with someone from our team! Thank you, we’ll be in touch with you soon!